Why use a billable hours tracker? Simple: it’s your livelihood. As a freelancer, it’s easy to switch between tasks and not truly know how much time you spent on a particular project. That translates to inaccurate billing, which isn’t good for anyone. You either miss out on revenue, or your client feels they are overpaying. Both possibilities impact your career and income. Instead of hurtling down the path of “Eh, close enough!” you could know exactly how you spend your days, and refine your process to work better for you. Still not sold? Here are the top five reasons to start using a billable hours tracker today. When a new client asks how long a project will take you to complete, you may think to yourself, “I have no idea.” Of course, every project and client is different. But with an hours tracker, you can see exactly how much time you spent on a similar project in the past and go from there. Because tracking hours has never been easier or more accurate, you can see exactly how you spent your billable time. There are time tracking apps for Android, iPhone, Windows, Mac and Chrome that make it easy to switch between projects, tasks and clients with just a few clicks. You can also get a clearer picture of how you spent your day with advanced time tracking features such as optional screen capture, activity level tracking, timesheets, invoicing and even GPS location monitoring. These features, which are controlled by you, allow you to more accurately track every phase of a project, including the in-between work times such as driving to a client meeting or having a kick-off call. The more data you have on how you spend your billable hours, the more accurate your future estimates will be. You know that feeling of getting into a rhythm and moving through projects with ease? That’s what time tracking apps allow you to do more freely. With an easy-to-use hours tracker, you can focus on the task at hand without having to interrupt work time just to record progress. The best hours tracking apps run in the background, gathering data and insights that you can then review after you’re done. Don’t bring your process to a screeching halt just to track what you’re doing. Let a time tracking tool work behind-the-scenes for you. Once you’re ready to review your hours, you can analyze your timesheet to find efficiencies. Did you spend too much time upfront on research for what the project required? Did you get pulled down a rabbit hole that derailed a task? What processes could you streamline in the future? Hours tracking helps you identify and optimize your own performance, to the benefit of your income and productivity. When you’re a freelancer, wasted time is wasted money. When you bill based on an hourly rate, spending time on non-billable work such as creating invoices and sorting through work logs is painful. Especially if you’re using a separate project management tool (or worse — spreadsheets), and are stitching time together manually. How much more money would you make if you could work one or two extra billable hours per week instead of creating invoices? Or how much time could you save and spend on personal activities like hanging out with your friends or going for a run if you didn’t have to manually fill in your work log? Using an hours tracker is like having your own project manager. You can see which tasks are taking more or less time and adjust timelines accordingly. The most effective hours tracker apps easily integrate with popular project management tools such as Trello, Asana, Basecamp and Jira. When your work hours tracker is synced with your project management app, you can see the project to-do list, deadlines and hours spent at each phase of the project in one place. It’s very likely that as a freelancer, you have bills to pay. Getting paid correctly and on time works wonders for your mental and financial health. Work tracker apps realize this, and have included automatic payroll features. Once your time is tracked, you can easily invoice clients and get paid directly within the billable hours tracker. 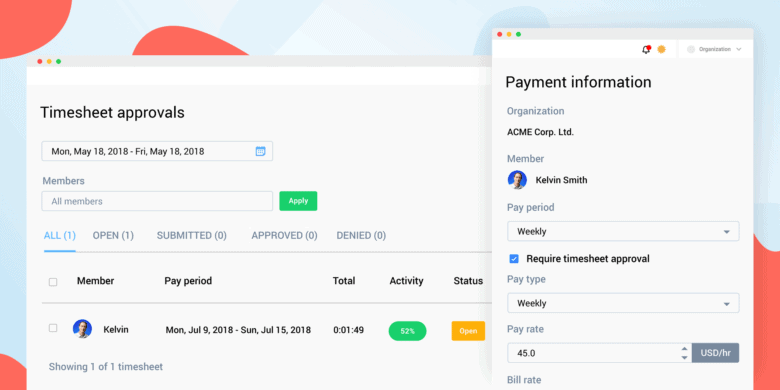 For this reason, it’s also important for work hours trackers to integrate with useful business and financial management services like QuickBooks, PayPal and Xero. This offers a better billing process, saves time on taxes and invoicing and leaves both you and your client confident in the project’s budget. Many hours trackers aim to simplify the parts of freelancing that you don’t want to spend most of your time doing. With the right hours tracker, you can eliminate cumbersome processes and more accurately track your billable time. Your freelance career, your clients and your bank account will thank you.